You see, she’s had a rough go of it these past few years, having had to go gluten-free and dairy-free. Giving up all of your favorite foods and replacing them with often sub-par imitations just isn’t fun or tasty. One of the things I know she misses a lot is ice cream. Though sorbet is wonderful in its fruity pleasures, there’s just nothing like the creamy, rich goodness of a bowl of ice cream. 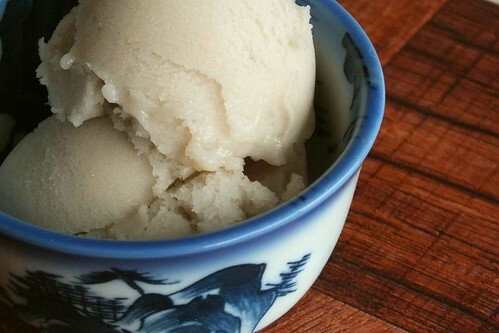 Recently, we made an experimental test batch of soy vanilla ice cream, using our ice cream maker and basing it off of a recipe in The Vegan Scoop. Because she’s also sensitive to several different gums, we needed to make sure she could have soy creamer, which honestly we weren’t sure about. After some research, we found that while she probably could have at least one brand of soy creamer, we weren’t sure if she’d be able to buy it easily or if it would be okay for her to consume safely. We also found that soy creamer was only necessary was because regular commercial soy milk isn’t creamy enough. If the milk itself was creamy, the two ingredients: creamer and milk, could be combined into one. One of our favorite mixes was provided as one of the sample mixes in our recipe booklet by the manufacturer of our maker, Sanlinx: a blend of black soybeans, sesame seeds and rice. It produces an interesting soy milk with chocolatey connotations, so we decided to use that for our base. The sesame seeds and rice help boost the creaminess, so no soy creamer was needed. So, without further ado, here is the complete recipe from beans to bowl for how to make your very own, completely safe for dairy-free, gum-free but not soy-free friends chocolate-vanilla ice cream. Soak soybeans for 8 hours. Rinse the rice and sesame seeds in a fine sieve (so the seeds don’t escape). Drain the soybeans well. Combine all three in the base of your soymilk maker. Add water until it comes up to the marking indicated for soy milk. Use the setting for Soy+ if you have it, Soy if not. When the maker finishes, strain the resulting liquid through a fine sieve to separate out the okara2 and pulp. Your maker’s capacity may vary. This is sized for my 1.5 l capacity SoyaPower Plus. If your maker is smaller, reduce the ingredients as needed, but keep the ratio the same: 2:2:1. This okara isn’t very reusable so we discarded it but normal okara from straight soy milk doesn’t need to be discarded. It can be used in lots of different ways, though if you make a lot of soy milk, you can quickly get overwhelmed. We like to add it to foccacia dough, any kind of ground meat, casseroles and sauces. Use it at your own discretion. Divide out 50 ml of soy milk, let it cool if you just made it from above, stir in tapioca starch. Combine remaining 700 ml of soy milk (it does not need to be cooled) with sugar and salt in a medium sauce pot and bring just to a boil. Remove from heat and stir in tapioca-milk mixture, the mixture should begin thickening noticeably. Add the vanilla extract. Stir well and chill for at least 2 – 3 hours or overnight2. Freeze in ice cream maker3 according to manufacturer’s instructions. Ours took about 15 minutes to freeze fully. If your scale doesn’t measure in 2g increments, increase the tapioca starch to 20 g. Arrowroot is a better choice than tapioca because it gels better at colder temps, but I didn’t have it available. Most ice cream books recommend 6 – 8 hours or overnight. We did 3 hours because we were impatient and our machine’s base was solidly frozen. Make sure your machine’s base has been in the freezer for at least 24 hours if you tend to be impatient. 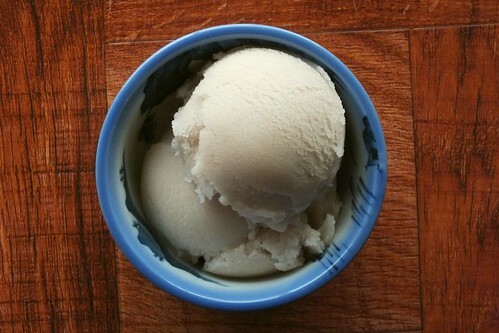 We use a Krups 1.5 l ice cream maker. It fit just fine with plenty of headroom. It should fit in machines with 1 liter capacity too, but I would keep an eye on it as the air gets whipped in. Finally, I prefer scaling my ingredients and, my husband, the baker, really prefers scaling, so honestly? I have no idea what any of this is in teaspoons or tablespoons unless it says. Sorry. Scales just rock. 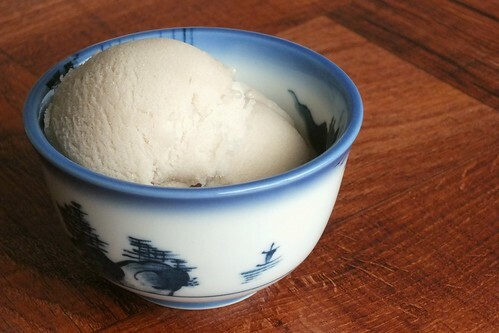 This entry was posted in dairy-free, gluten-free, ice cream, recipes, untranslated, vegan, vegetarian. Bookmark the permalink.